What kind of commands can you teach a dog that cannot see or hear? Dogs that cannot see or hear can be taught tactile cues. These are cues that the dog can feel through its body somehow. I can use touch in different ways and on different parts of my dog's body as requests for certain behaviors (sit, lie down, etc) or to provide information (mealtime, car ride, outside, etc). I can also use anything that my dog can feel as a cue. I can use differing surfaces as cues. I also use gently blowing on my dog as a cue, and puffs of air as a cue. As long as my dog can perceive the information through touch, I can turn that into a cue by using it consistently to mean the same thing each time. It is also possible to use scents as cues, but these must be used carefully because scent does not usually stay in one place - it drifts around - and scents can mix together or stay in an area for an extended period of time. So using scents as cues needs to be well-thought out and put into place by someone who has taken the time to learn about scent/odor. My dogs have a touch cue to come to me - a swipe forward under their chins. They also recognize that when I blow toward them, they follow my breath back to come to me. The blowing is handy in the house and sometimes outside. But if it is breezy or my dog is too far away from me, my breath is not strong enough to always reach them in a direct manner. I also can sometimes use turning on or off a light in the house to signal that I am leaving a room and want my dog to come with me. If the difference between light and dark is significant, my blind/deaf dogs can sense the change in light even though they have no vision. They know that means we are leaving the room and will come with me. Flashing a porch light at night can sometimes work as well unless they are way far out in the yard and the change in light is not as significant - then they don't notice. Is it hard to teach blind/deaf dogs new tricks or commands? There are many variables in teaching any dog new things. If those variables are put into place with a blind/deaf dog, it is not hard to teach them new things. All dogs (even blind/deaf dogs) learn new things all the time on their own ... they learn that sitting instead of jumping might bring a treat; they learn that jumping up onto the counter will find them a tasty treat; they learn that pulling on a leash usually gets them to where they want to go faster ... you get the idea. If you know what the dog finds reinforcing, and you can provide that reinforcement after the behaviors you like, the dog will learn to do those things more and more. Then you can add a cue to it (see above about tactile cues), and voila! 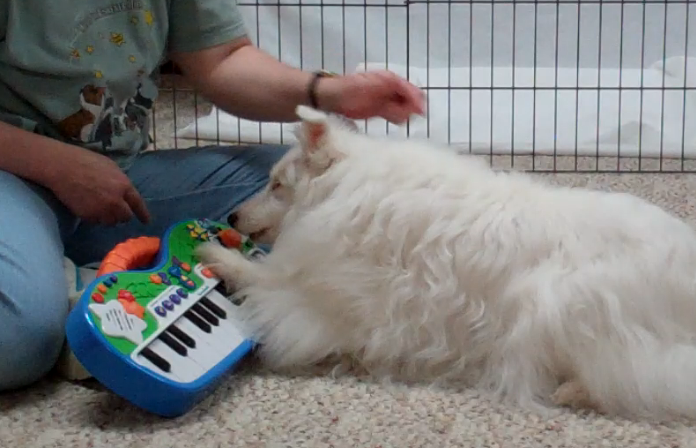 You've taught your blind/deaf dog something new! You can also utilize methods of getting the behavior you want, such as luring, shaping and capturing, just like you can with a dog that can see and hear! Sometimes teaching a blind/deaf dog does require a little bit of thinking outside the box and adding creative ideas to your lessons, but the ideas of teaching remain the same. Double merles can have varying visual abilities - ranging from perfectly normal to totally blind. Some may even have impairments with their sight that will continue to deteriorate over time, as they get older. Others will maintain whatever level of sight they do have for their lifetime. There really is no definite answer to this question. A veterinary ophthalmologist will be able to examine the dog's eyes and give you an idea of what type and extent of impairment there is, as well as a guess as to how or if it will progress. I am not aware of any studies showing that double merles have any higher incidents of health issues than other dogs. While there are many double merles with other health issues and weakened immune systems, there are also so many non-double merles with these issues. And there are many double merles that are healthy for their entire lifetimes, just like there are many non-double merles without major health problems. It's important when breeding any dog to take many things into consideration and to do health and genetic testing, etc, to make sure the puppies have the best chance for perfect health and well-being. Of course, we know that most double merles do not come from breeders who have done their homework and tested both parents extensively before breeding. There are now genetic tests available for so many health conditions that can be passed on from parent to puppy. It's easy to rule out the chances of these being passed on before the mating is even done. So, without that testing and attention being paid to a new litter, it is likely that double merles (and non-double merles) that are bred in this way will pass along any health issues that they have. Some dogs that are labelled as special needs do have medical issues. There are so many different medical conditions that a dog can have. It's important to know what these issues are as much as possible when you are considering adopting a dog with special requirements, whether double merle or not. Thanks for sharing your knowledge. This is a useful article - will certainly help people learn how to communicate with their deaf/blind dogs.